My grandfather was a man of few words. But on one particular issue, he had something to say and he expected you to listen. But how do today’s Scandinavians vote when it comes to the annual Eurovision Song Contest? In this month’s GoFigure! Report, we unpacked Eurovision data by country since 1956 (!) to discover which countries align themselves through reciprocal vote-sharing, the strength of these networks, and the impact that this loyalty can have on a network’s chance to snag a victory for one of the countries in their network. If you watch Eurovision, it will come as no surprise that Scandinavia is the most historically cohesive voting bloc in the contest. The tall blondes vote for each other—we all saw that one coming. All told, this voting bloc has grabbed 13 first-place wins since the contest’s inception in 1956, with one win for Finland, three for Denmark, three for Norway, and six for Sweden. In 1963, Denmark pulled in the first win for the Scandinavian bloc with Dansevise, performed by husband and wife duo, Grethe and Jørgen Ingmann. In 1974, a new and little-known group called ABBA hit the stage with their single, Waterloo, to secure Sweden’s first win. To celebrate 50 years of Eurovision in 2005, European televoters cast their ballots for the best Eurovision song of all time—and Waterloo took the prize. And among all of the winning Scandinavian numbers, Norway’s Fairytale by Alexander Rybak is the highest scoring song by percentage of possible points. Fair warning: if ABBA isn’t your style, Alexander isn’t going to top your list either. But you have to give him props for those fiddle squats. But why has Sweden won six times while other Scandinavian wins are more seldom? Like Grandpa Tore, I had my eye on Sweden, and I was compelled to take this one step too far further. In fact, Eurovision’s most loyal voting bloc is only mostly Scandinavian. This bloc leads the pack in group cohesion and total 1st-place wins thanks to the odd man out—Ireland. That’s right, Ireland. The country with the record for most Eurovision wins of all time. What do we see here? When we examine historical voting patterns in the Eurovision Grand Finals, each country’s “biggest fan” is a fellow Scandinavian country. Norway is Sweden’s biggest fan, giving the Swedes more total points than any other country in the competition since 1956. Norway is also Denmark’s biggest fan, beating Sweden by five points to be the country with most Eurovision love for the Danes. And for Norway, Finland, and Iceland, Sweden is their biggest fan. On the surface, there’s a lot of love here, and Sweden gives their fair share of it. Or do they? #1: Iceland – #1 most supported country is Sweden, top 3 most supported countries are Scandinavian, and has given 240 more points to Scandinavians than it has received. #2: Finland – #1 most supported country is Sweden, single most supported country is Scandinavian, and has given 172 more points to Scandinavians than it has received. #3: Norway – #1 most supported country is Sweden, top 2 most supported countries are Scandinavian, and has given 148 more points to Scandinavians than it has received. #4: Denmark – #1 most supported country is Sweden, 1st and 3rd most supported countries are Scandinavian, and has taken 84 more points from Scandinavians than it has given. #5: Sweden – #1 most supported country is not Scandinavian and has taken 476 (!!) more points from Scandinavians than it has given. 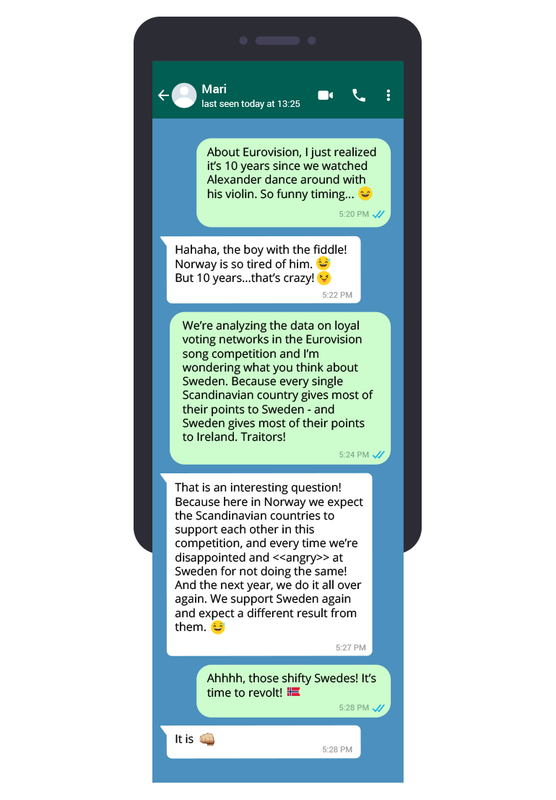 Below is perhaps the most fascinating way to visualize and compare Sweden’s promiscuous Eurovision voting habits to its neighbors’ notably more loyal approach to the contest. Because while Sweden is a member of the single most cohesive voting bloc in the history of Eurovision, it’s actually a member of eight cohesive networks. And while Norway, Denmark, Finland, and Iceland only belong to networks with at least one other Scandinavian member, Sweden is sneaking around in three other strong networks without their fellow Scandis. In fact, they belong to more networks with Ireland than they do with their fellow Scandinavians. Where Ireland goes, Sweden follows. Every single strong network in which we find Ireland, we also find Sweden. The Norwegians, Danes, Finns, and Icelanders throw their points at Sweden year after year while Sweden and Ireland laugh all the way to the 1st place podium. Feeling vindicated, I cracked a Tuborg and sent a message to my Norwegian friend Mari. We realized it was the 10-year anniversary of Norway’s last win. Back in 2009, we’d tuned in together from Notodden, Norway, to watch Alexander take the Eurovision crown in all his fiddle-flinging glory. Want to increase your chances of winning at Eurovision this year? The data says it all.